After the close of the Second World War many Russian refugees settled into Displacd Persons Camps throughout Germany. One of these camps was located in Fischbeck. Nikifor and Olga Fedorov and their extended families resided in this particular camp, under the spiritual guidance of the then Archimandrite Vitaly Ustinov ( Met.Vitaly 2006). This particular camp was inhabited by mainly orthodox families. Fr. Vitaly established a chapel and church school, the camp church was the center of life for everyone in the camp. In the late 1940's some of those families decided to move West to North America, first settling in Canada and eventually settling in Albany, New York. It was these immigrants with their genuine love for the Church and a desire to raise their children and grandchildren in the faith, that a search for a place to hold services began. With guidance from God, a close bond grew between the Holy Trinity Monastery in Jordanville and the Albany Parish, which still flourishes and benefits the parish this day. Shortly after Olga and Nikifor arrived in Albany, Archmandrite Panteleimon (co-founder of the Holy Trinity Monastery), introduced the Albany Parish members to Bishop Brown, the Episcopalian Bishop of Albany. Bishop Brown's family lived in Jordanville and was acquainted with Farther Panteleimon. With the quidance of the Holy Trinity Monastery, a close relationship developed between the Parish Founders and Bishop Brown. With his assistance, the search for a temporary church soon came to fruition. With his generous help, services were temporarily held in a side room of the Cathedral of the Immaculate Conception. One of the parishioners built a portable iconastasis, and soon, priests from Holy Trinity Monastery came to Albany to conduct services. Time passed and the search continued for a more permanent parish home. By the mid 1950's, after six years at the Episcopal Cathedral, a permanent home was found. With the assistance of Bishop Brown, the parish purchased the Anglican Church of the Holy Innocent at a significantly reduced price. The beautiful church, with a rare artisan stain glass windows was located on the corners of North Pearl and Colonie streets in Albany. The church had been built in the mid-1800's when the neighborhood flourished with its lumber yards, iron industries and breweries. Thus the Church of Nativity of the Mother of God came into existence. The Russians, mainly Fedorov-Nikiforov families, made it as much like an Ortodox Church as possible... An iconastas was hand carved by Nikifor Fedorov for the Alter, the steeple was replaced with an onion dome and cross. Over the years, icons were hung on the walls and continue to adorn the walls of our new Church. The first permanent priest assigned to the parish was Farther Michael Komlikov, who also had come from Germany. The second priest was Farther Aristarex Katzubinsky, but he was elderly, had difficulty serving, and soon retired. The parish was fortunate to have visiting hieromonks and priests from the Holy Trinity Monastery, serving in the interim. Our beloved rector Mitered Protopriest Wsevolod Drobot (+2017) was assigned to the Parish in 1962 by Metropolitan Anastasy Gribanovsky (+1965). The Albany parish remained in the church building at Pearl Street for almost 25 years. As the neighborhood declined, Fr. Wsevolod Drobot moved his family from the parish house to Jordanville,NY to be close to the Holy Trinity Monastery and to have a safer haven for his wife and children. He thus became our non-resident priest, driving from Jordanville to Albany to conduct all services. The aging church required continuous renovation and became costly to maintain, so a decision was made to sell. Since the founders had always dreamt of having a Orthodox church and instilled this goal in their children, a search began for land to build. The church was finally sold in July 1984, and a quick transition began. Albany parishioners began attending services at the Schenectady Parish, The Protection of the Mother of God on Euclid Avenue. The parish priest there was Fr. Moses Tarasevitch who held bi-monthly services for its approximate 20 members. Fr Moses alternated serving Sundays in Schenectady and Springfield, Massachusetts. Parish life continued to flourish in the cozy quarters of the Schenectady Church. So much so, in 1987 the Eastern Diocese officially combined the Albany and Schenectady parishes into one. Holy Virgin Mary Russian Orthodox Church was created, which, today is known as parish of The Nativity of the Mother of God. The search continued for a suitable piece of land to realize our founders dream. With the proceeds from the sale of the Albany Church, the Church Council and parishioners agreed to purchase 2.9 acres on Sand Creek Road in the Town of Colonie, NY. In 1988, Vladika Laurus blessed the land and construction of the Church Hall began in earnest. The Church Hall was constructed with the sweat and toil of the majority of our parishioners. Even seminarians drove down from the Holy Trinity Monastery to lend a hand for the successful completion! By 1991, the Hall was open for functions and started supporting the Church Mortgage Fund and remains a large benefactor today. It has allowed our Sisterhood to prepare for and hold many money making ventures, concerts and benefits, and we also rent the Hall out to the public. The Hall became a place for the Parish family to gather after liturgy, strengthening our bonds. With God Mercy and the hard work performed in the Hall, the parish was able to build a magnificent Church in the honor of Our Mother of God. The construction of the new church began in August of 2004. On Sunday, September 19, 2004, His Eminence Laurus consecrated the foundation of the New Church of the Nativity of the Mother of God. We were moving from Schenectady Church to our New Church during the sixth week of the Great Lent in 2005. 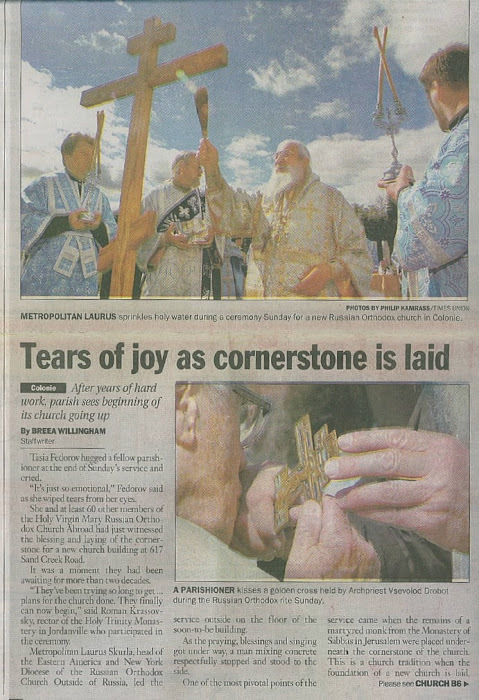 On Lazarus Saturday, April 23, 2005, His Eminence Metropolitan Laurus along with Protodeacon Joseph Jarostchuk and Subdeacon Nicholas Olhovsky, visited our parish and performed the minor consecration of the new Church of the Nativity of the Mother of God. At the end of the service, His Eminence congratulated the Rector, all those who labored towards the church’s construction, the parishioners and worshipers, wishing them all God’s help in their further labors for the speedy completion of the construction. That evening, the Rector, Mitred Protopriest Wsevolod Drobot, Father Michael Fritz and Deacon Michael Soloviev and all the parishioners, performed the first service in the new church. Archpriest Wsevolod Drobot came to the Albany, NY parish only by God’s mercy. After the end of World War II, Batushka and his parents settled in Argentina. There they attended church at the cathedral in Buenos Aires, where he served in the altar with Archbishop Joasaph (Skorodumov; +1955) of blessed memory. His Eminence advised and blessed the young Wsevolod to attend seminary and be ordained a priest. So, on the stormiest day of the year, December 23, 1958, Wsevolod and Nadezhda Drobot arrived from Argentina to begin his studies at Holy Trinity Seminary in Jordanville, NY. After completing the required years at seminary, he was to return to help the clergy in Argentina. By the summer of 1960, Father Wsevolod was ordained a deacon and was blessed with a growing family. On August 27, 1961, Father Wsevolod was ordained a priest and was assigned to serve in the Protection of the Mother of God Parish in Schenectady, NY, while he completed his last year of seminary. In June 1962, he graduated and was assigned to serve in Queens, NY. But to Fr. Wsevolod’s relief, Metropolitan Anastassy (Gribanovsky; +1965) reconsidered and gave his blessing for Fr. Wsevolod to serve in the growing parish of Albany, NY. On our parish feast day, the Nativity of the Mother of God, September 21, 1962, Archbishop Averky (Taushev; +1976) happily introduced our new rector, Father Wsevolod Drobot. The rest, as they say, is history.Fr. Wsevolod was our parish rector for 52 years. Due to his dedication and hard work we were able to build a new church in honor of the Nativity of the Mother of God. Fr. Wsevolod reposed in the Lord on November 8, 2017. He is greatly missed by many to whom he was a spiritual father, a guide, a mentor, and a friend. We love you, Batuska! Memory Eternal!